I always expected my retirement to come with plenty of peace and quiet, but sometimes it is hard to find. A couple of years ago we went canoeing in Florida with Terry's brother and sister-in-law. We left early and no one was around when we began paddling up a quiet stream toward the spring that is its source. Just us and the waking wildlife. So peaceful. We kept on paddling until it was so shallow that we were having to haul the canoes over too many downed trees, and then we decided to head back downstream. Upstream hadn't been hard, but downstream was even easier; all we had to do was use a paddle to steer the canoes as we floated with the flow of the water. But as we neared the mouth of the stream, we began hearing airboats all around us. The local fishing camp (a bar on the river) was sponsoring an airboat rally. Those things are amazingly noisy! Later, I got to take a ride on one, and it was fun, but right then the noise totally ruined the mood of our day. Near my home in Chapala, the government has put a lot of money into fixing up the malecon - I guess you'd call it a boardwalk in the states. It is essentially a lakeside park with a wide tiled walkway bordered by trees. It is a wonderful place to walk in the mornings. Traditionally, the government also paid people to sweep the walkway early each morning with large bundles of twigs tied together to make a broom. The sweepers were poor people and this job was a substitute for welfare. Last year the brooms were replaced with leaf blowers run by young men. The blowers make a terrible racket and raise huge clouds of dust, ruining the ambience. It seems to me that we are loosing our peace and quiet to machinery. I know that some noisy toys are really fun, and some of the noisy machines make work easier for some people, but I wonder if they are worth it. I used to love snow skiing, or even just walking through the snowy woods, the only sound the plop of snow falling from the branches above. But if snow mobiles showed up, my fun was ruined. Consider the peacefulness of fly fishing or even relaxing in a small boat with a line in the water. Does it really matter if you catch a fish? But using up gas while trolling around the ocean means you have to holler to be heard and puts a different kind of pressure to actually catch something to show for the expense. I used to love kneading homemade bread. It was a lot of work, but it helped get rid of a lot of stress and the smell and taste of the wonderful bread made it all worthwhile. Bread machines took all that away and the bread just wasn't the same. While I was never crazy enough to piece my quilts by hand (well, there was that one I made by hand from my daughters baby clothes), I have found over the years that the parts of quilting I like best are the hand applique and hand quilting. The machine work of piecing gets to be so boring to me. The hand stitching is almost like meditation. I don't have to think about anything but making those stitches as small and even as possible. I've included one of my favorite pictures above. It just looks so peaceful and relaxing to me. 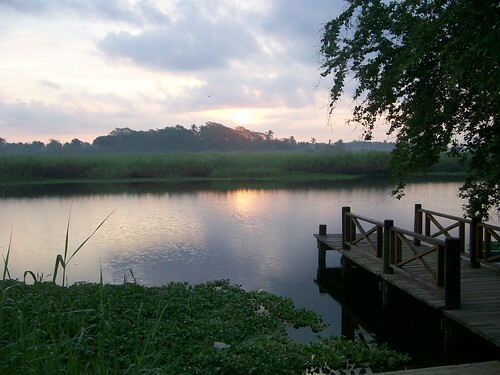 I would love to be able to sit on the end of that dock to meditate as the sun comes up. I know it would be nice and quiet. The problem is that the lagoon is now choked with water hyacinths and a crocodile is likely to climb onto the dock with me. But I know the only noise I would hear would be the thousand mosquitos circling before landing.